It was really comfortable and I honestly had a great time staying there. Close to the train station. Housekeeping is good. Ladies staff is good special the lady wearing long hair and with good shape.She is always smile to the guests and very helpful. Good standard hotel located about 15 minutes from the airport. Clean and good wifi. So glad we were able to have our dogs stay with us for a small fee. We had a restful stay. Our room was very clean and quiet. Close to the train station, which was 8 mins from Köln HBF. Having a great KFC just across the road served a good purpose for a quick meal. Will definitely stop again if and when we visit Köln again. Breakfast was very good, you could even make your own waffles. Getting to/from the city (or airport) was easy with the public transport stop just a few minutes away from the hotel. Everything was clean too, inside and outside the room. The staff was very friendly and efficient at all times. A great thanks to the lovely Marina. I really enjoyed the homemade breakfast. In addition, the resort was close to the Autobahn, but still quite serene. ibis Hotel Köln Airport This rating is a reflection of how the property compares to the industry standard when it comes to price, facilities and services available. It's based on a self-evaluation by the property. Use this rating to help choose your stay! The Ibis Hotel Köln Airport is just east of Cologne city center. It offers free WiFi in all areas and good access to Cologne's tourist attractions, the KölnMesse Exhibition Center and Cologne-Bonn Airport. The cozy rooms at the 3-star Ibis Köln Airport include modern amenities, including internet access and air conditioning. There is a free internet terminal in the lobby. 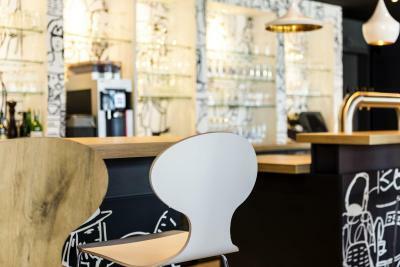 The bar and reception of the Ibis Köln Airport are open 24 hours a day. Drinks and snacks are available 24/7. A rich breakfast is served between 04:00 and 12:00 each day at the hotel. Guests can relax and have a drink on the hotel terrace in good weather. Parking spaces are available on site for an additional charge. Gremberghoven is a great choice for travelers interested in beer, old-town exploration and history. When would you like to stay at ibis Hotel Köln Airport? This simply furnished room has a TV, work desk and private bathroom with a hairdryer. Public parking is available on site (reservation is not possible) and costs EUR 3 per day. House Rules ibis Hotel Köln Airport takes special requests – add in the next step! ibis Hotel Köln Airport accepts these cards and reserves the right to temporarily hold an amount prior to arrival. Bed was uncomfortable, poor mattress, poor duvet, miserable staff, expensive beer. Never again in a budget hotel! Women service are much better than the man,who is a little bit fat.He was supper rude to guests. No resturants around. Even KFC is not 24h. No hot water cooker in the room. Payed 220 euro per night because of the IDS fare. Nice staff, close to train, good and safe parking. For less money very good. Non-smoking room smelled like cigarettes. Secure parking with access card. Staff, bad wifi, asking money besides the 100 euro for a room to park you car for a night on their property. Just could be better with simple things. Staff was not really friendly. Never greeting guests and on check in the guy was not friendly at all. A bit far from everything if you want to find a place to eat that is not KFC.